With hot topics like Brexit, recruitment and profit margins all high on the agenda, it’s more important than ever that businesses complete Cumbria Tourism’s new survey capturing the current successes and challenges facing the county’s £2.9 billion tourism sector. The Tourism Business ‘Health Check’ being carried out in association with Lamont Pridmore, aims to provide a snapshot of how the industry is performing by giving tourism businesses the chance to comment anonymously on the issues and trends affecting trade. As the county’s official Destination Management Organisation, Cumbria Tourism has been tracking this information for a number of years and it continues to be a vital source of data. This latest ‘health check’ focuses on the last six months (April-September 2018) and the responses collected will be used to benchmark the county’s long-term performance. This means Cumbria Tourism can identify both ongoing and emerging issues. It can also continue highlighting the right issues with both national and regional policy-makers to promote a stronger visitor economy. In recent months, this high-profile influencing has included meetings with the Tourism Minister, the Transport Minister, the Home Office and the Minister responsible for the Northern Powerhouse project, as well as the county’s six MPs, VisitEngland and the Department for Digital, Culture, Media and Sport. Cumbria Tourism has also used evidence gathered directly from businesses to successfully lobby for a £285,000 marketing campaign funded by the rail industry. Gill Haigh, Managing Director of Cumbria Tourism, adds, “We are here to support both individual tourism businesses and the county’s £2.9billion visitor economy as a whole. So, by taking a few moments to let us know how their business is doing, every participant is contributing to a valuable source of data. In turn, this first-hand evidence helps us to keep up the pressure on issues around funding, support and future strategy at the highest levels and to focus our resources on the issues that matter most. For the first time, Cumbria Tourism has teamed up with one of the North West’s leading firms of accountants, tax and business advisors, Lamont Pridmore, to support the research. Cumbria Tourism’s comprehensive research function is one of the key activities which sets it apart as Cumbria’s official Destination Management Organisation. 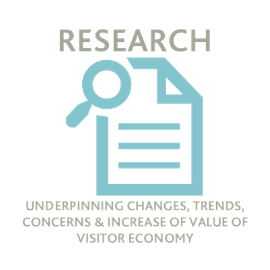 As well as the Business Performance Survey, other regular analysis carried by Cumbria Tourism’s research team includes monthly occupancy surveys, county-wide visitor surveys, regular analysis of accommodation stock and data collection from visitor attractions.